This page serves as a working document for the design of a parts manager for gEDA. Please submit feedback to the geda-dev or geda-user mailing lists. For implementation details, see gparts_id. Or, return to the part manager top level page. The part manager uses a relational database to store parts used in the development of electronic assemblies. The part manager also stores attributes for these parts and can place these attributes into a component or symbol for placement into schematics. The part manager provides a GUI that allows the user to browse and edit the data in the part database. 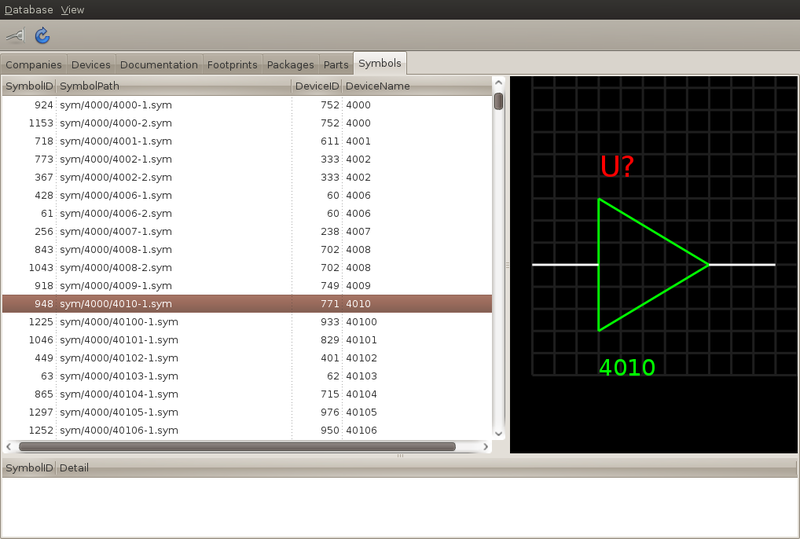 The user can select parts in the GUI, then cut and paste them into their schematic. The following figure shows the relationship between the parts manager and other applications in the gEDA suite. The part database can be configured as either local or remote. In the remote configuration, many users can access the part database concurrently. The following figure shows the entity relationships for a part in the resistor category. The category does not reference any tables in the resistor category, but only contains the view name and stored procedures to manipulate a part within the resistor category. This mechanism allows the tables and relationships to vary by category. The database always contains tables to store the following entities. The database contains additional tables to store specific categories of parts (e.g. a capacitor table, a diode table, a resistor table, etc…). This list excludes junction tables and metadata tables. A class of parts (e.g. capacitors, diodes, resistors, transistors, etc…). A category can contain sub-categories (e.g. small-signal diodes, TVS diodes, zener diodes, etc…) Sub-categories can include additional sub-categories. All parts within a category or sub-category share the same set of attributes (e.g. forward voltage, maximum current, power dissipation, etc…). Sub-categories do not need to inherit the attributes of their parent. The category stores metadata for mapping the part’s database columns to the component attributes. For numeric attributes, the category stores the column’s unit of measure (e.g. amps, farads, ohms, volts, etc…). The category also stores the names of database views and stored procedures to access and manipulate the tables of parts within the category. Currently, a company represents a part’s manufacturer. A type of part. The device name only provides a mechanism to map parts to symbols. A part in the library of device resistor can use all the symbols in the library where device is resistor. Similarly, a symbol where device is resistor can represent any part of device resistor. When importing a symbol, the database uses the value of the symbol attribute DEVICE as the initial value for the device field. The user can change the device field after import using the part manager GUI. Any file associated with a part. Documents can include datasheets, erata, user manuals, etc… This entity stores a path to the actual document file. The path could either be local or network. The path stored in the database is relative to the base path stored in the configuration file. The PCB artwork associated with a package. 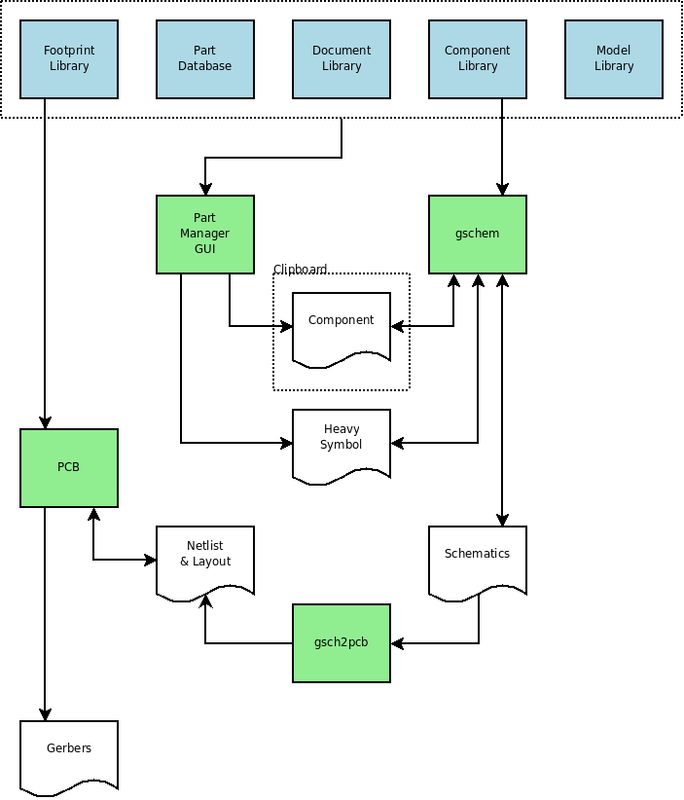 This entity stores a path to the actual PCB footprint file. The path could either be local or network. The path stored in the database is relative to the base path stored in the configuration file. ModelName String The name of the MODEL within the model file. ModelPath String Absolute path to the model file. 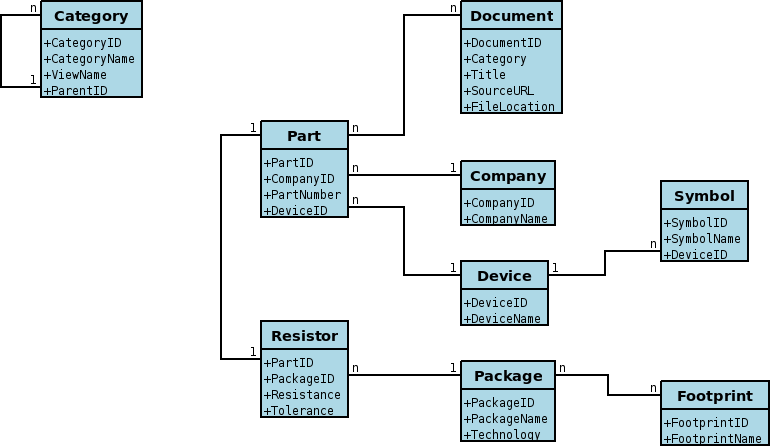 When instantiating a component or creating a heavy symbol that uses a Spice model, the following database columns map to the following attributes. Model.ModelPath FILE Should use absolute path. A part represents a class of components. The database uses this version of the part table when configured to use a flat part table. The flat and hierarchical parts tables are mutually exclusive. The database uses one or the other. A part represents a class of components. The database uses this version of the part table when configured to use hierarchical part tables. The flat and hierarchical parts tables are mutually exclusive. The database uses one or the other. The physical structure, or form-factor, of a part (i.e. 0603, SOT-23, PDIP16). Each package can associate with zero or more footprints. Also, each footprint could represent zero or more packages. The graphical representation of a part. This entity uses the symbol base filename as the unique name of the symbol. This base filename is relative to one of the component libraries found in the configuration files. The component library paths can either be local or network. SymbolName String The unique name of the symbol. This field contains the base filename of the symbol. The part manager GUI is the main component of the part management system. The part manager GUI allows the user to browse and manipulate the part database and to cut and paste symbols into the schematic editor. Copy a part to the clipboard as a component (light symbol). The user selects a part in the database. The user selects a symbol to represent the part. The GUI instantiates a component and overrides attributes. The user previews the component to ensure the graphic looks correct. The user selects the copy action. The GUI copies the component to the clipboard. The user pastes the component in gschem. Export a part to a file as a heavy symbol. 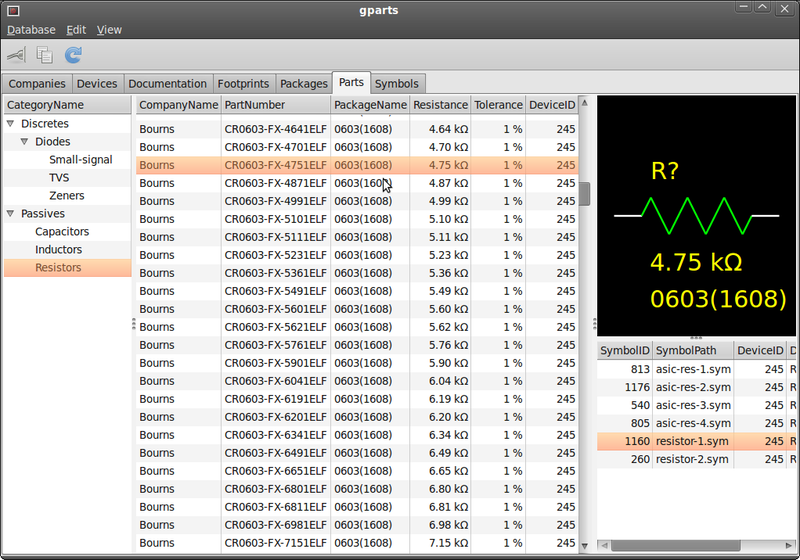 The GUI clones the symbol and substitutes attributes. The user previews the symbol to ensure the graphic looks correct. The user selects the export action. The GUI prompts the user for a filename and location. 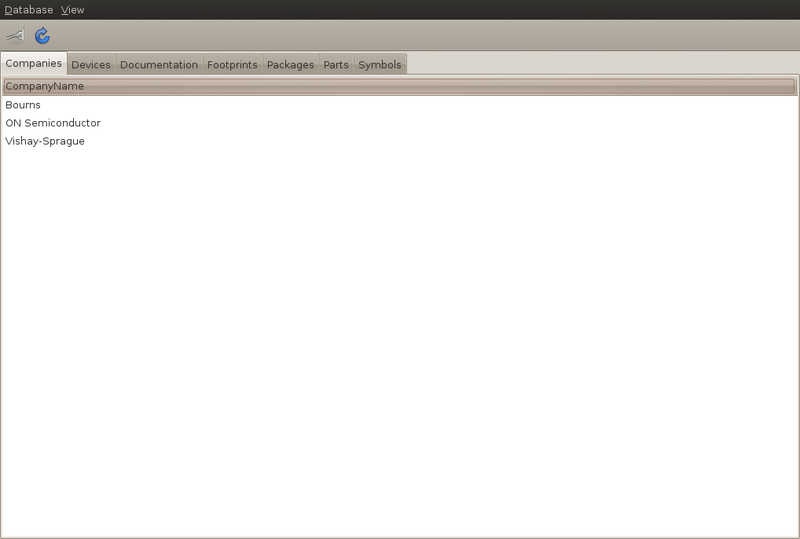 The GUI writes the symbol to the given file. Create a new part database. The user selects the destroy database action. The GUI prompts the user for confirmation. The application drops the database. The user selects the add document action. The application adds the document to the database. Associate a document(s) with a part(s). The user selects one or more parts from the database. The user selects the attach document action. 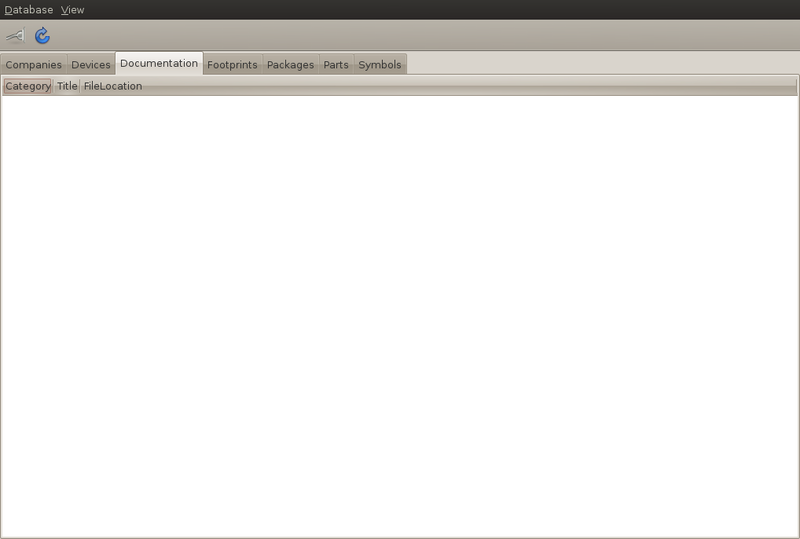 The GUI prompts the user with a list of all the documents in the database. The user selects one or more documents from the list. The application attaches the given documents to the given parts. Delete a document(s) from the database. Remove all references. The user selects one or more documents in the database. The user selects the delete action. The application deletes the selected documents from the database. Disassociate a document(s) from a part(s). All parts and documents remain in the database. Only the relationship is removed. The user selects the detach document action. 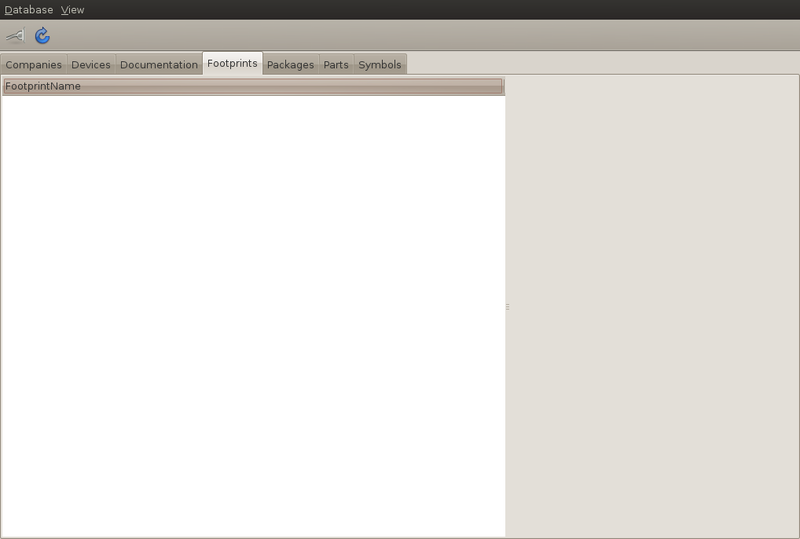 The GUI prompts the user with a list of all the documents attached to the given parts. The application detaches the given documents from the given parts, if attached. Edit the metadata associated with a document. Delete a footprint(s) from the database. Remove all references. The user selects one or more footprints in the database. The application deletes the selected footprints from the database. Edit the metadata associated with a footprint. Import a single footprint file into the database. The user selects the import footprint file action. The GUI prompts the user for a footprint file. The application creates a footprint in the database for a new footprint file. The application updates a footprint in the database for an old footprint file. Import all footprint files from the library into the database. The user selects the import footprint library action. The application searches all footprint libraries. The application creates footprints in the database for new footprint files in the library. The application updates footprints in the database for old footprint files in the library. Add a new model to the database. The user selects the add model action. The GUI prompts the user for a model type, name, and filename. The application adds the model to the database. Associate a model(s) with a part(s). The user selects the attach model action. The GUI prompts the user with a list of all the models in the database. The user selects one or more models from the list. The application attaches the given models to the given parts. Delete a model(s) from the database. Remove all references. The user selects one or more models in the database. The application deletes the selected models from the database. Disassociate a model(s) from a part(s). All parts and models remain in the database. Only the relationship is removed. The user selects the detach model action. The GUI prompts the user with a list of all the models attached to the given parts. The application detaches the given models from the given parts, if attached. Import all Spice files from the library into the database. The user selects the import Spice library action. The application searches all Spice library directories for files. The application parses files to extract model names. The application creates Spice models in the database for new models in the library. The application updates Spice models in the database for old models in the library. Add a new package to the database. Delete a package(s) from the database. Remove all references. The user selects one or more packages in the database. The application deletes the selected packages from the database. Add a new part to the database. Delete a part(s) from the database. Remove all references. The user selects one or more parts in the database. The application deletes the selected parts from the database. Search for a part in the database using the manufacturer part number. Delete a symbol(s) from the database. Remove all references. The user selects one or more symbols in the database. The application deletes the selected symbols from the database. Edit the metadata associated with a symbol. Import a single symbol file into the database. The user selects the import symbol file action. The GUI prompts the user for a symbol file. The application creates a symbol in the database for a new symbol file. The application updates a symbol in the database for an old symbol file. Import the contents of the component library into the database. The user selects the import symbol library action. The application searches all component libraries specified in the configuration file for symbol files. The application creates symbols in the database for new symbol files in the library. The application updates symbols in the database for old symbol files in the library. The company view lists all the companies in the database. The device view lists all the devices stored in the database. 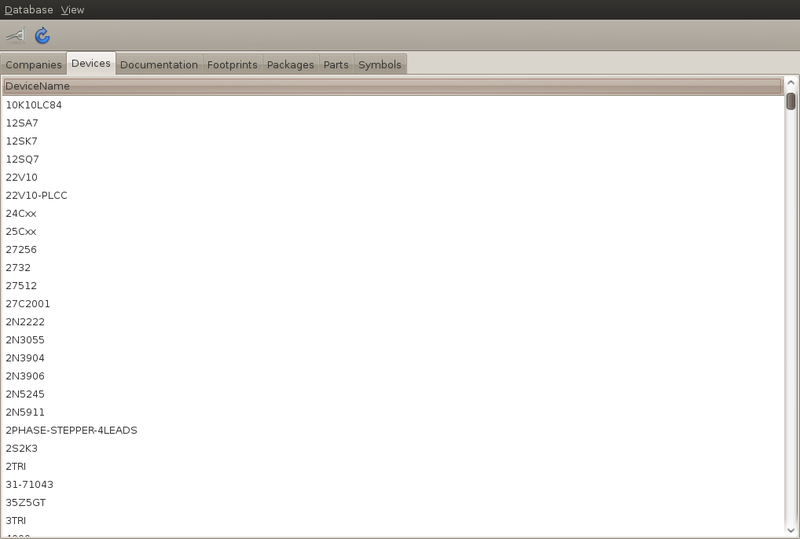 The documentation view shows all the documents stored in the database. The footprint view shows all the footprints stored in the database. 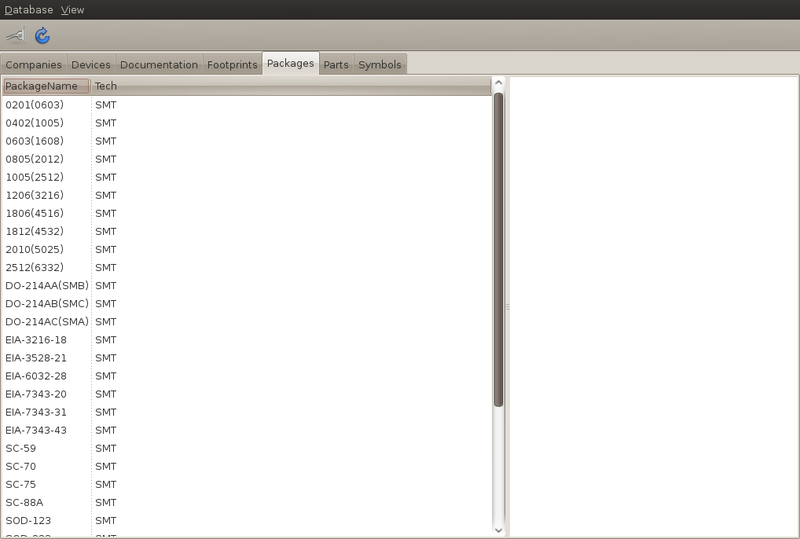 The package view shows all the packages stored in the database. The part view shows parts stored in the database. The user selects the category from the left pane. The parts within the given category show in the middle pane. After selecting a part from the middle pane, the symbols available for that part show in the lower right pane. The upper right pane shows the symbol preview. The edit→copy command places the component on the clipboard. 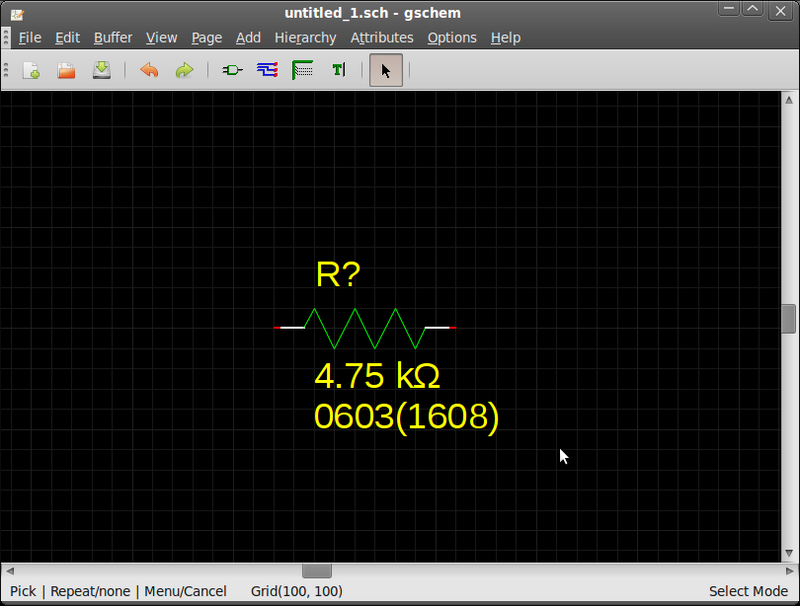 The component can then be pasted into gschem. The symbol view shows all the symbols stored in the database. The upper right pane shows the symbol preview. The parts manager reads gaf's Scheme configuration files using Guile-1.8. The parts manager reads the following configuration files in order. The parts manager attempts reading the file in each of the given paths in order. The parts manager supports the following configuration items from gaf. The parts manager supports the following private configuration items. The parts manager uses dynamically loadable modules to support the various database engines. The parts manager uses a separate module to support each database engine. Adds a directory to the list of directories where documentation is stored. Adds a directory to the list of directories where footprints are stored. The parts manager can import newlib footprints from these directories. Adds a directory to the list of directories where SPICE models are stored. The parts manager can import these models from these directories.